It allows amateurs to communicate internationally and directly without using any kind of intermediate system that regulates their activities. Because of the power and scope of amateur radio, hams need a minimum amount of technical and regulatory background so that they can coexist with other radio services, such as broadcasting. Pretty heady stuff, eh? Ham radio does all these good things in exchange for access to radio space along with the commercial and government users. You can find all the pertinent rules at FCC.gov; click the Part 97 link for the amateur radio rules. Plain-English discussion of the rules is available in FCC Rules and Regulations for the Amateur Radio Service, published by the American Radio Relay League (ARRL). To keep order in the growing radio communications field, a group of countries got together as the International Telecommunication Union, based in Geneva, Switzerland. The ITU, which is part of the United Nations, provides a forum for countries to create and administer rules of radio spectrum use. 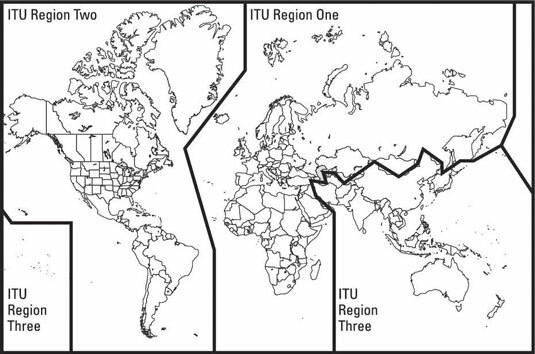 The ITU divides the spectrum into small ranges in which specific types of uses occur. These ranges are frequency allocations, which hams call bands. Within each region, each type of radio service — amateur, military, commercial, and government — is allocated a share of the available frequencies. Luckily for amateurs, most of their allocations are the same in all three regions, so they can talk to one another directly. 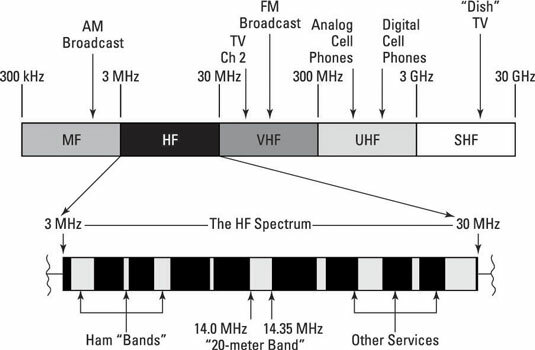 Below are the high-frequency (HF) range frequencies (from 3 MHz to 30 MHz). This allocation is very important, particularly on the long-distance bands, where radio signals might propagate all the way around the Earth. Talking to someone in a foreign country is pretty difficult if you can’t both use the same frequency. Amateurs have small allocations at numerous places in the radio spectrum, and access to those frequencies depends on the class of license you hold. The higher your license class, the more frequencies you can use.